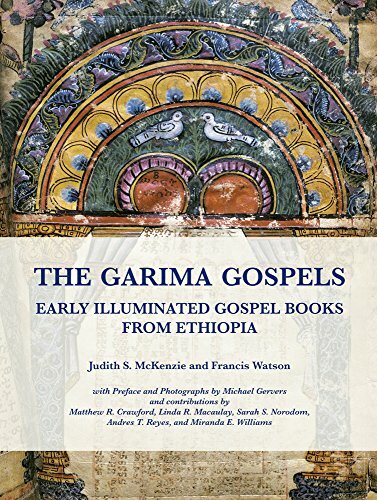 The three Garima Gospels are the earliest surviving Ethiopian gospel books. They provide glimpses of lost late antique luxury gospel books and art of the fifth to seventh centuries, in the Aksumite kingdom of Ethiopia as well as in the Christian East. As this work shows, their artwork is closely related to Syriac, Armenian, Greek, and Georgian gospel books and to the art of late antique (Coptic) Egypt, Nubia, and Himyar (Yemen). Like most gospel manuscripts, the Garima Gospels contain ornately decorated canon tables which function as concordances of the different versions of the same material in the gospels. Analysis of these tables of numbered parallel passages, devised by Eusebius of Caesarea, contributes significantly to our understanding of the early development of the canonical four gospel collection. The origins and meanings of the decorated frames, portraits of the evangelists, Alexandrian circular pavilion, and unique image of the Jerusalem Temple are elucidated. The Garima texts and decoration demonstrate how a distinctive Christian culture developed in Aksumite Ethiopia, while also belonging to the mainstream late antique Mediterranean world. Lavishly illustrated in colour, this volume presents all of the Garima illuminated pages for the first time and extensive comparative material. It will be an essential resource for those studying late antique art and history, Ethiopia, eastern Christianity, New Testament textual criticism, and illuminated books. If you have any questions about this product by Manar al-Athar, contact us by completing and submitting the form below. If you are looking for a specif part number, please include it with your message. By International Publishers Marketing, Inc.